ওরাল পোলিও ভ্যাক্সিন (OPV) একটি বিশেষ ধরণের টীকা। ভাইরাসকে পুরোপুরি না মেরে শুধু নিষ্ক্রিয় করে রাখা হয় বলে একে অ্যাটেনিউয়েটেড ভ্যাক্সিন বলা হয়। produced by the passage of the virus through non-human cells at a sub-physiological temperature, which produces spontaneous mutations in the viral genome. Oral polio vaccines were developed by several groups, one of which was led by Albert Sabin. Other groups, led by Hilary Koprowski and H.R. Cox, developed their own attenuated vaccine strains. In 1958, the National Institutes of Health created a special committee on live polio vaccines. The various vaccines were carefully evaluated for their ability to induce immunity to polio, while retaining a low incidence of neuropathogenicity in monkeys. Large-scale clinical trials performed in the Soviet Union in late 1950s to early 1960s by Mikhail Chumakov and his colleagues demonstrated safety and high efficacy of the vaccine. Based on these results, the Sabin strains were chosen for worldwide distribution. There are 57 nucleotide substitutions which distinguish the attenuated Sabin 1 strain from its virulent parent (the Mahoney serotype), two nucleotide substitutions attenuate the Sabin 2 strain, and 10 substitutions are involved in attenuating the Sabin 3 strain. The primary attenuating factor common to all three Sabin vaccines is a mutation located in the virus's internal ribosome entry site (IRES) which alters stem-loop structures, and reduces the ability of poliovirus to translate its RNA template within the host cell. The attenuated poliovirus in the Sabin vaccine replicates very efficiently in the gut, the primary site of infection and replication, but is unable to replicate efficiently within nervous system tissue. OPV also proved to be superior in administration, eliminating the need for sterile syringes and making the vaccine more suitable for mass vaccination campaigns. OPV also provided longer lasting immunity than the Salk vaccine. In 1961, type 1 and 2 monovalent oral poliovirus vaccine (MOPV) was licensed, and in 1962, type 3 MOPV was licensed. In 1963, trivalent OPV (TOPV) was licensed, and became the vaccine of choice in the United States and most other countries of the world, largely replacing the inactivated polio vaccine. A second wave of mass immunizations led to a further dramatic decline in the number of polio cases. 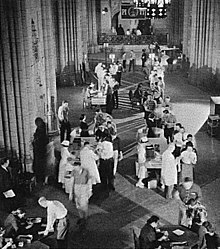 Between 1962 and 1965 about 100 million Americans (roughly 56% of the population at that time) received the Sabin vaccine. The result was a substantial reduction in the number of poliomyelitis cases, even from the much reduced levels following the introduction of the Salk vaccine. OPV is usually provided in vials containing 10–20 doses of vaccine. A single dose of oral polio vaccine (usually two drops) contains 1,000,000 infectious units of Sabin 1 (effective against PV1), 100,000 infectious units of the Sabin 2 strain, and 600,000 infectious units of Sabin 3. The vaccine contains small traces of antibiotics—neomycin and streptomycin—but does not contain preservatives. One dose of OPV produces immunity to all three poliovirus serotypes in approximately 50% of recipients. Three doses of live-attenuated OPV produce protective antibodies to all three poliovirus types in more than 95% of recipients. OPV produces excellent immunity in the intestine, the primary site of wild poliovirus entry, which helps prevent infection with wild virus in areas where the virus is endemic. The live virus used in the vaccine is shed in the stool and can be spread to others within a community. The live virus also has stringent requirements for transport and storage, which are a problem in some hot or remote areas. As with other live-virus vaccines, immunity initiated by OPV is probably lifelong. A potential, but rare, adverse effect of the oral polio vaccine (OPV) is its known ability to recombine to a form that may cause neurological infection and cause paralysis. Clinical disease, including paralysis, caused by vaccine-derived poliovirus (VDPV) is indistinguishable from that caused by wild polioviruses. This is believed to be a rare event, but outbreaks of vaccine-associated paralytic poliomyelitis (VAPP), caused by a circulating vaccine-derived poliovirus (cVDPV), have been reported, and tend to occur in areas of low coverage by OPV, presumably because the OPV is itself protective against the related outbreak strain. In 1960, it was determined that the rhesus monkey kidney cells used to prepare the poliovirus vaccines were infected with the SV40 virus (Simian Virus-40). SV40 was also discovered in 1960 and is a naturally occurring virus that infects monkeys. In 1961, SV40 was found to cause tumors in rodents. More recently, the virus was found in certain forms of cancer in humans, for instance brain and bone tumors, pleural and peritoneal mesothelioma, and some types of non-Hodgkin's lymphoma. However, it has not been determined that SV40 causes these cancers. SV40 was found to be present in stocks of the injected form of the polio vaccine (IPV) in use between 1955 to 1963. It is not found in the OPV form. 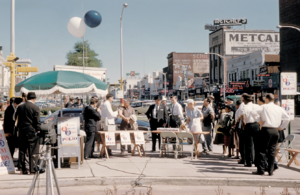 Over 98 million Americans received one or more doses of polio vaccine between 1955 to 1963 when a proportion of vaccine was contaminated with SV40; it has been estimated that 10–30 million Americans may have received a dose of vaccine contaminated with SV40. Later analysis suggested that vaccines produced by the former Soviet bloc countries until 1980, and used in the USSR, China, Japan, and several African countries, may have been contaminated; meaning hundreds of millions more may have been exposed to SV40. In 1998, the National Cancer Institute undertook a large study, using cancer case information from the Institute's SEER database. The published findings from the study revealed that there was no increased incidence of cancer in persons who may have received vaccine containing SV40. Another large study in Sweden examined cancer rates of 700,000 individuals who had received potentially contaminated polio vaccine as late as 1957; the study again revealed no increased cancer incidence between persons who received polio vaccines containing SV40 and those who did not. The question of whether SV40 causes cancer in humans remains controversial however, and the development of improved assays for detection of SV40 in human tissues will be needed to resolve the controversy. 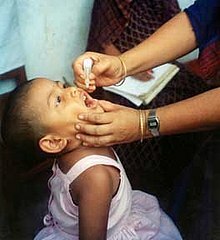 During the race to develop an oral polio vaccine several large scale human trials were undertaken. By 1958, the National Institutes of Health had determined that OPV produced using the Sabin strains were the safest. Between 1957 and 1960, however, Hilary Koprowski continued to administer his vaccine around the world. In Africa, the vaccines were administered to roughly one million people in the Belgian territories, now the Democratic Republic of the Congo, Rwanda and Burundi. The results of these human trials have been controversial, and accusations in the 1990s arose that the vaccine had created the conditions necessary for transmission of SIV from chimpanzees to humans, causing HIV/AIDS. These hypotheses have, however, been refuted in some studies. By 2004, cases of poliomyelitis in Africa had been reduced to just a small number of isolated regions in the western portion of the continent, with sporadic cases elsewhere. However, recent opposition to vaccination campaigns has evolved, often relating to fears that the vaccine might induce sterility. The disease has since resurged in Nigeria and in several other African nations, which epidemiologists believe is due to refusals by certain local populations to allow their children to receive the polio vaccine. A breakthrough came in 1948 when a research group headed by John Enders at the Children's Hospital Boston successfully cultivated the poliovirus in human tissue in the laboratory. This group had recently successfully grown mumps in cell culture. In March 1948 Thomas H. Weller was attempting to grow varicella virus in embryonic lung tissue. He had inoculated the planned number of tubes when he noticed that there were a few unused tubes. He retrieved a sample of mouse brain infected with polio virus and added it to the remaining test tubes, on the off chance that the virus might grow. The varicella cultures failed to grow but the polio cultures were successful. This development greatly facilitated vaccine research and ultimately allowed for the development of vaccines against polio. Enders and his colleagues, Thomas H. Weller and Frederick C. Robbins, were recognized in 1954 for their labors with a Nobel Prize in Physiology or Medicine. Other important advances that led to the development of polio vaccines were: the identification of three poliovirus serotypes (Poliovirus type 1 — PV1, or Mahoney; PV2, Lansing; and PV3, Leon); the finding that prior to paralysis, the virus must be present in the blood; and the demonstration that administration of antibodies in the form of gamma globulin protects against paralytic polio. ↑ Lisa Barron, "Armenian Health Ministry: Syrian Armenian children need polio vaccine", CISTran Finance, 4 Nov 2013. Retrieved 18 Dec 2013. ↑ David Oshinsky "Miracle Workers," American Heritage, Winter 2010.